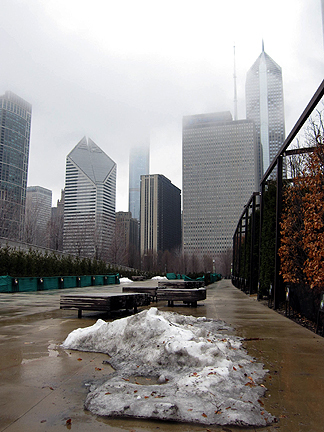 Today I'll share some photos of Chicago from my recent trip to the Flower & Garden Show. It was warm and overcast, and spring was definitely in the air. 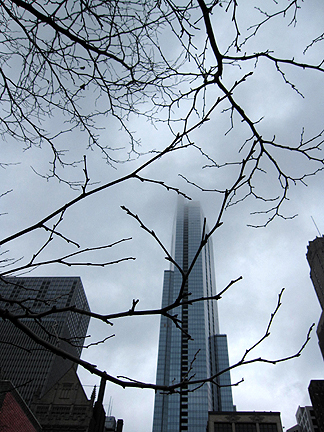 I really liked the softness of the fog contrasted with the starkness of the skyscrapers, all nestled in the limbs of Mother Nature. I just can't not go to Millennium Park. 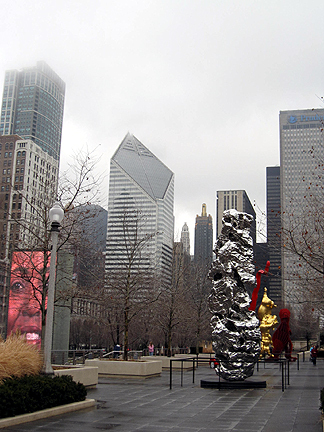 I liked the foggy grayness juxtaposed with the bright, shiny, and illuminated artwork there. On March 11, I think it was home to the last bit of snow downtown. 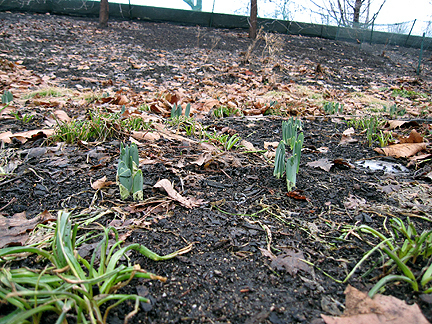 Daffodils are making their way up from the beds surrounding Millennium Park. 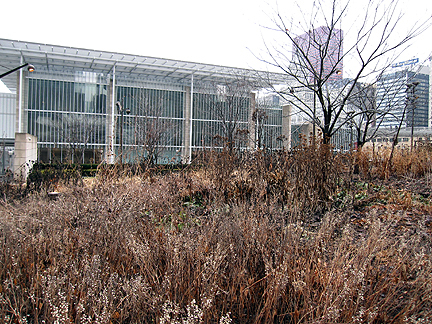 The garden at the Art Institute of Chicago has also been cut back. (I'm looking forward to the upcoming Matisse exhibit there!) And, Phoenix C., the bench is just for you! I also never get enough of seeing the Cloud Gate (or bean). 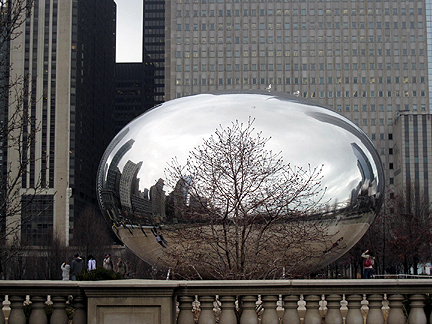 On this overcast day, it was really obvious how the Cloud Gate was named. ...and from so many angles. 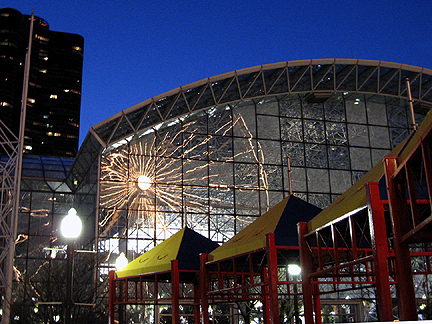 The flower show took place on Navy Pier, which juts into Lake Michigan. 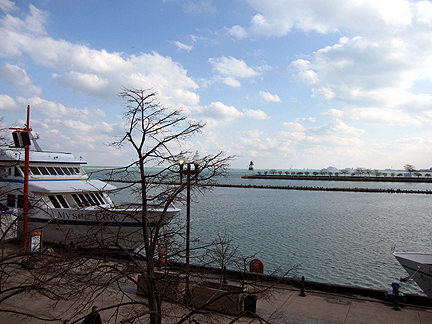 Lots of boats provide tours in warmer weather. 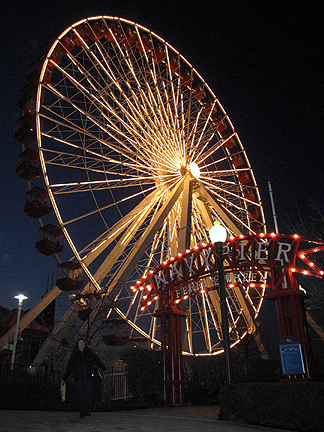 There are a lot of attractions on Navy Pier, like this ferris wheel. I was congratulating myself on the great composition of this shot when I realized I'm in the photo, which means it's good because Mr Brown Thumb took it! I was tickled by the reflection of the ferris wheel on the glass palm house. 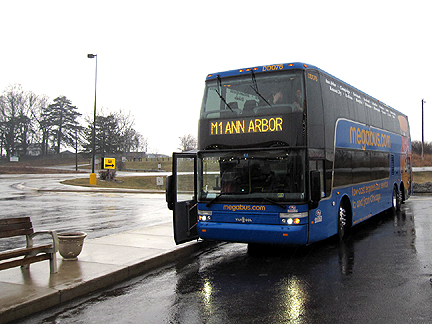 My favorite way of traveling between Ann Arbor and Chicago is megabus. It's comfortable, and faster and cheaper than the train. Costs vary depending on how far in advance you book, with rates being slightly higher Fridays through Mondays. My last journey was $20 round trip and a ride I booked for April was $11 round trip. What can I say. I'm a cheap date. Great post. What a fabulous place to visit. I lived in Chicago for a short time back in 1971. I was just a young girl. Chicago looks like such an interesting city, thank you for taking us along. Gene went to Chicago for a conference and was surprised by how much he liked it. Hi Monica. Thanks for the tour. How beautiful. 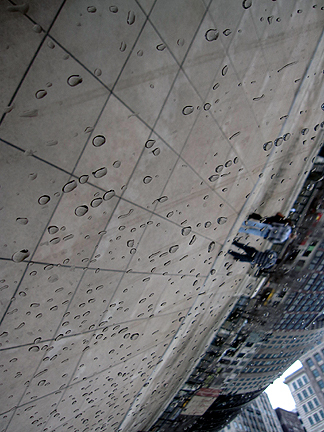 I love the reflections at all angles that come off of the surface of the bean cloud. I bet the park is gorgeous when in bloom. You saw lots of interesting things while in Chicago. The bus would be the best way to travel there. Heck you couldn't even buy gas for that price. I've only been in the airport. One day I will go there to visit! Chicago is a clean and vibrant city. I spent a few days there many years ago and enjoyed it. What a great deal the megabus offers.....sounds perfect. Enjoyed the tour Monica and have fallen for the Cloud Gate. You seem to visit Chicago regularly. How far is it from you and what is a megabus? Monica, I had no idea there was a bus like that. How wonderful for you. Your photos are great shots of Chicago. That area is very attractive and so worth visiting anytime one is there. 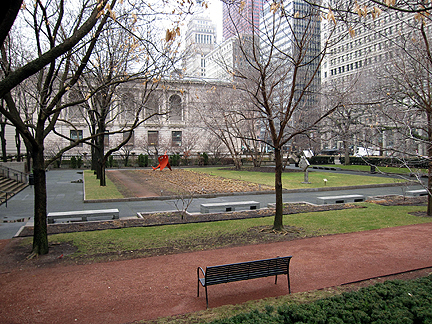 Rose and I want to go back to visit the Lurie when the weather warms and of course the Botanical Gardens. Maybe you could take the bus and join us! Great pics Monica. I especially like the ones with silver in them as it really "pops" on those cloudy days. I just went back to the post to look closer at some of the pics and thought to myself, "Self, remember to take a picture like Monica's picture of the ferris wheel." Then I read the caption. Ha on the ferris wheel photo. I'm sure it would be just as good if you took it. My son and DIL got married at the Navy pier. Neat area. 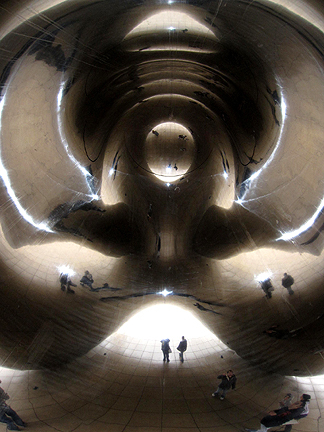 The inside of the cloud gate is cool! I didn't even know you could go in it. It's neat to see the gardens during their transition periods. Ah, I just love Chicago! Made a Rick Bayless dish just last night. You've got some lovely shots and I especially like the "bean" ones. That bus would be a great way to travel. I'll bet riding in the top, you get wonderful views. Loves the photo of the ferris wheel reflected in the glass. Looks like a spidery sun. 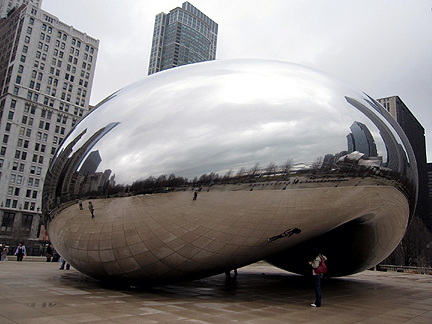 Looks like you had a great time -- love your photos of Cloud Gate! What a fun tour of my old stomping ground. I didn't live there but it was so close to Minneapolis, and had so many friends there, that it was my cultural escape nearly every month. Awesome photos, Monica. I think my favorites are the third shot of Cloud Gate and the reflection of the ferris wheel in the glass palm house--very cool! Looks like you had a great time. What a trip..you just took me on. I otherwise, would not have been so blessed. I loved the lettuce and wheat grass, climbing lily, well, all of it. Thanks for the tour. Come visit and check in my followers for Mel at Up North With Mel and tell her I sent you there for her hypertufa recipe...she has made some beauties. There are rural and mountainous areas of North America that I would really like to visit but, thanks mainly to your photos, Chicago is the only city on my dream list. This post has made that desire stronger. It looks elegant and interesting . . . and has good buses! It all looks so different then the pictures of Spring Fling! A bit sleeping but starting to awaken. Cheap Date, ha, the less you spend on somethings, the more you can spend on other things such as flowers! Beautiful photos, Monica! 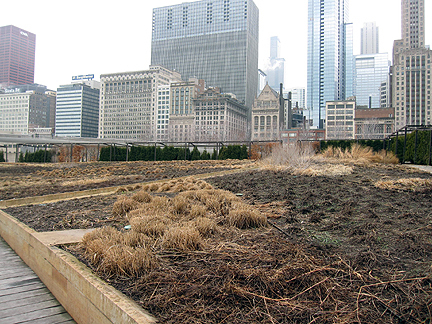 So glad you showed the Lurie Garden; I've been wondering what it looked like at this time of year. I did see some snow here in AZ--on Friday we went to the Grand Canyon. There was more snow around Flagstaff than I think I saw all winter in the Midwest! So when is the Matisse exhibit?? I've been thinking about taking the two older grandkids up to Chicago for the day. Grandson #1 is a budding artist, and I'd love to show him the Art Institute. My choice of transportation is by car to the far south of Chicago, then by train, but $20 roundtrip from Ann Arbor is quite a deal!